It really can be an endless summer - if you're immortal. Though a vampire would be ill-advised to take a cruise to Bermuda, the possibilities for getting away from it all - and maybe snacking on some unsuspecting tourist - are many... Sookie Stackhouse and her vampire friend Pam take a weekend getaway to Mississippi in #1 New York Times bestselling author Charlaine Harris's "Two Blondes." And when they end up in a shady gentleman's club, to escape in one piece they need to do something that wasn't on their itinerary - something involving a stage, a pole, and very little clothing. New York Times bestselling author Katie MacAlister's "The Perils of Effrijim" follows a demon whose vacation in Paris is disrupted when he's banished to another plane, thus kicking off a crazy dimension-hopping road trip across Europe. Protecting an heiress from supernatural hit men isn't Cat and Bones's idea of a relaxing vacation in New York Times bestselling author Jeaniene Frost's "One for the Money," but it could get worse. And it does - when Cat's mother shows up. 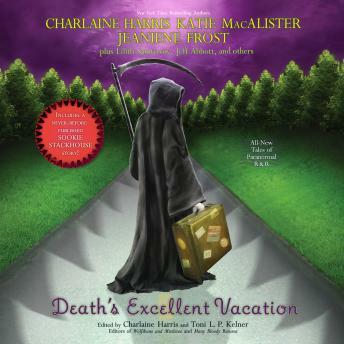 Editors Harris and Kelner bring together a stellar collection of tour guides who offer vacations frightening, funny, and touching - for the fanged, the furry, the demonic, and the grotesque. worst reading ever horrible voices horrible horrible horrible.